When you think of ways to strengthen your business and grow revenue, you might create new products or try a new promotion. But what about getting online ordering? Data from the 2012 Restaurant Industry Forecast states that 53% of adult diners said that they would likely place their orders online, meaning that businesses could gain a huge chunk of customers by just offering an online ordering service. EatOnTheWeb, an online ordering application, can give you all of these benefits and more. EatOnTheWeb was designed to help businesses keep pace with their competition by combining a quick and clean ordering experience with a beautiful and easy-to-create online menu. If you’ve already been using Business Plus Accounting, it’s an easy integration into online ordering. EatOnTheWeb bridges the gap between your Point of Sale and your online ordering system, creating a smooth operation with no errors or lost orders. It’s custom-made for your business. EatOnTheWeb works for any kind of restaurant business. Easily set up your online menu using our new and innovative “Integrated Online Ordering System” and you are already on your way to customizing your menu in whichever way you please. The beautiful and polished design. EatOnTheWeb is designed with style and simplicity in mind so you can give your customers a better website without losing functionality. 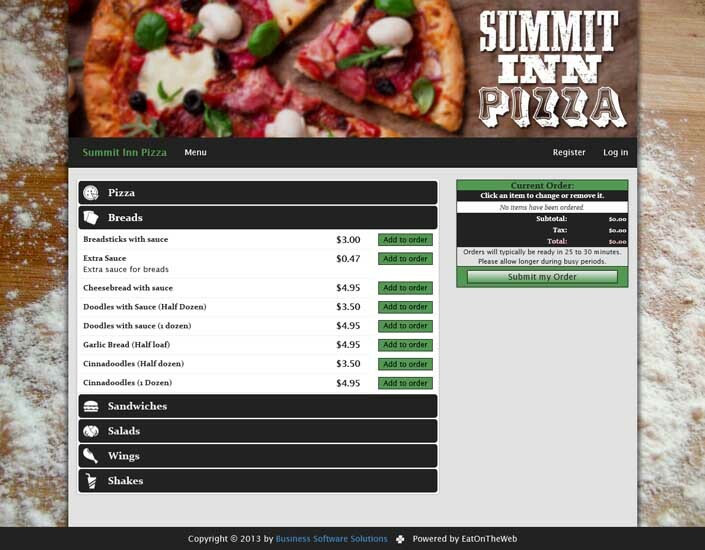 Its design keeps restaurant owners happy by allowing them the option to customize the entire site how they’d like it. We will theme the entire site to match whatever existing site you may have, using your logo and whatever else you may wish for cheap. You can order from anywhere. With an easy interface that can be accessed from anywhere, EatOnTheWeb will bring customers in from PC, IOS, and Android. With the convenience of being accessed from anywhere, you can easily increase sales revenue among those who want food in a quick and easy manner. With free technical support, you can have help with your EatOnTheWeb whenever you please. We will show you how to use EatOnTheWeb whenever you need. We won’t stop until you are satisfied with our service. If you haven’t used EatOnTheWeb yet – or if you want to try it out, feel free to check out our EatOnTheWeb demo or give us a call at (801)-336-3303 for more information. Business Core Values | Business Software SolutionsDo you and your team of employees know what your core values are? Whether you run a restaurant or a...3 Ways To Grow Your Online Reputation | Business Software SolutionsHave you ever wondered how important your online business reputation really is? According smallbizt...Let Us Know How We Can Help Your Business SucceedWe want to help you and your business succeed. This post is a survey that will help us do that.